Rita, look at all that stunning texture. I just adore fall, and I love this card! The dark background looks great with the sunflowers. Thanks for playing the Midnight Madness Sketch Challenge this week. Really pretty, I'd love to see more! Rita what an amazing beauty. The presentation of the sunflower...my favorite die cut....is phenomenal. Great job with the sketch this week. Thank you so much for playing along with the Midnight Madness Sketch Challenge. Oh so beautiful, Rita! Love your stunnin flower...and that sentiment is just sooo true! 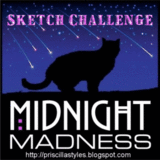 Thanks so much for playing this week in the Midnight Madness Sketch Challenge! Hugs!! Wow your card is so adorable. Your flower and sentiment go perfectly together. 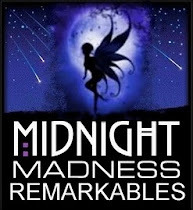 Thanks so much for joining us this week at Midnight Madness! What a great late summer/fall card. I love your sun flower with the flock in the center and all the textures and colors you used is so autumnal - super! This is such a pretty card Rita. I saw it in the MMSC gallery and just couldn't help but comment here. 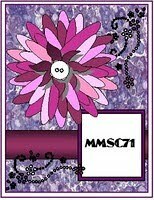 I love the warm feeling of this card and the embellishments in addition to the focal flower. And the sentiment is so perfect. Best wishes on the challenge.